For many companies their employees are the key resource and the rivalry for this resource is very strong. The bigger the company becomes the less noticeable is the contribution of an individual. This could be very demotivating for employees. And more and more efforts are needed to keep the personnel up. In the same time such quantitative growth makes the communication between company’s management and employees more difficult. The information gets lost on its way and not always people clearly understand the primary objectives and priorities. HR Grades allows companies to solve these problems by setting up transparent competencies matrix, share the expectations with employees, build individual plans for professional development and running regular assessments. To do all of that you won’t need to hire an expensive HR consultant. And you won’t need any IT-skills to maintain or support the service. Use "Contact us" button to raise any questions you might have. 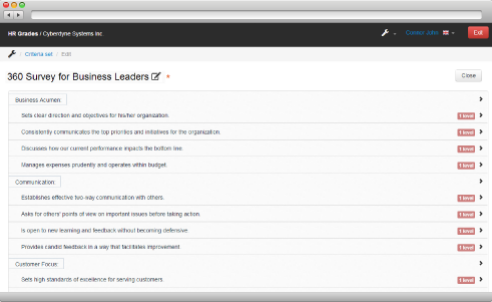 You can use one of templates or list your own set of skills required from employees on a proper position. You can differentiate the value of proper skill for your business by using levels and weights. 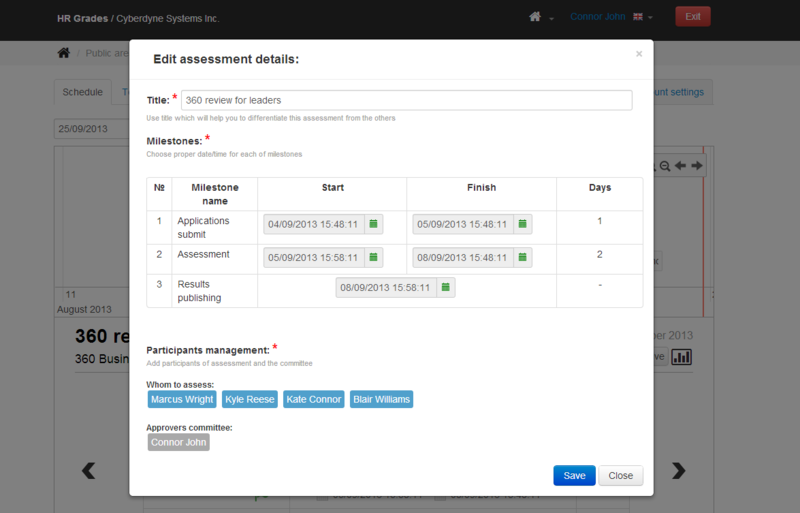 You can schedule assessment sessions for specific groups of users. It will start automaticaly at a pointed time. Employees will submit their forms indicating their strengths and weaknesses in the key areas you defined. 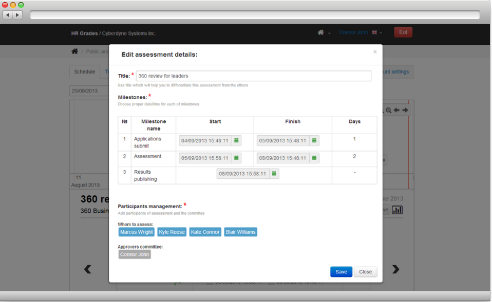 Then supervisors and managers will review submitted forms. Finally, the acceptance phase will take place. You can involve more people in the assessment of others to make an objective judgement on person's achievements. Such people are called "experts" in the system. Every expert can put some comments against the competence and provide the feedback or make any recommendation as for the further progressing of a person. 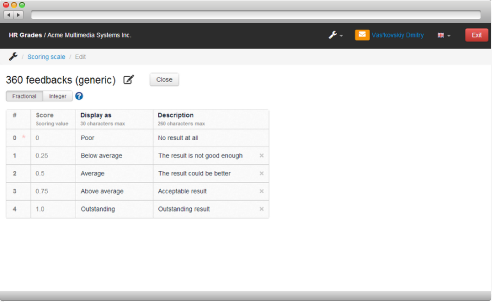 System calculates the individual rating based on the assessment results. 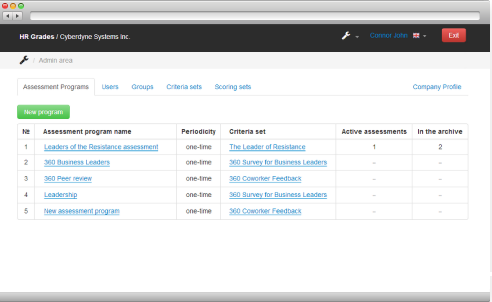 You can use reports to see the progress for the whole company or to compare progress of individuals. 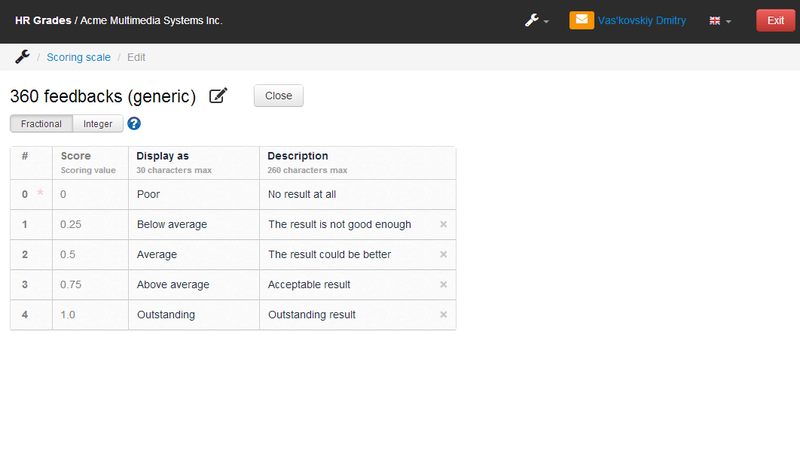 You can export the results and use them for salary calculation. We try to make the process of employees assessment available even for non-HRs, attempt to combine simplicity and flexibility. And we keep improving. At the moment HR Grades allows you the following. 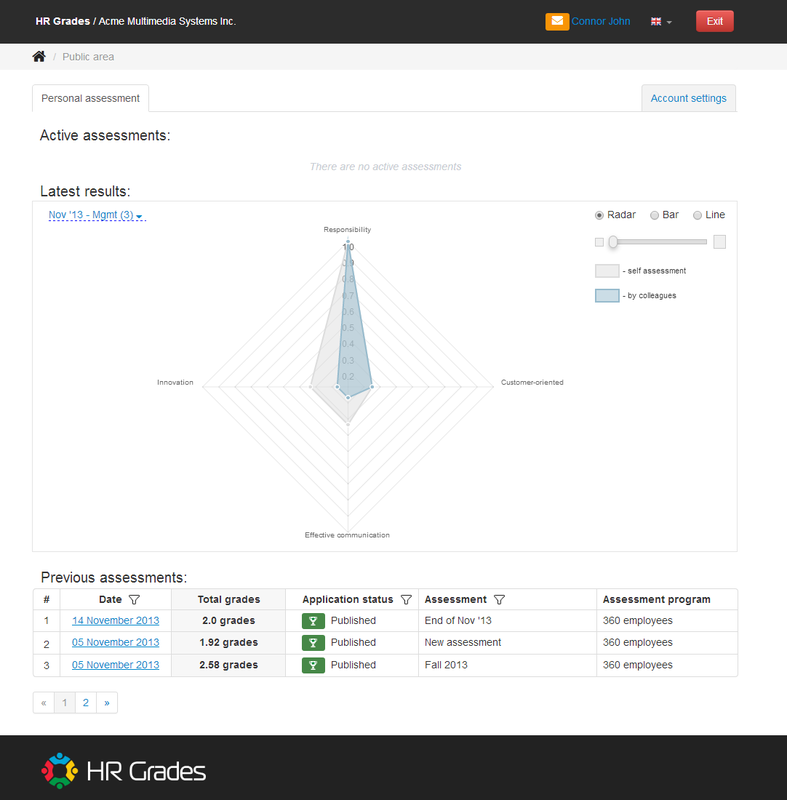 HR Grades allows you to use custom competencies which reflect the essence of your business domain. These are the key competencies and skills you want employees to master. Differentiate their meaning and importance by assigning levels and weights. 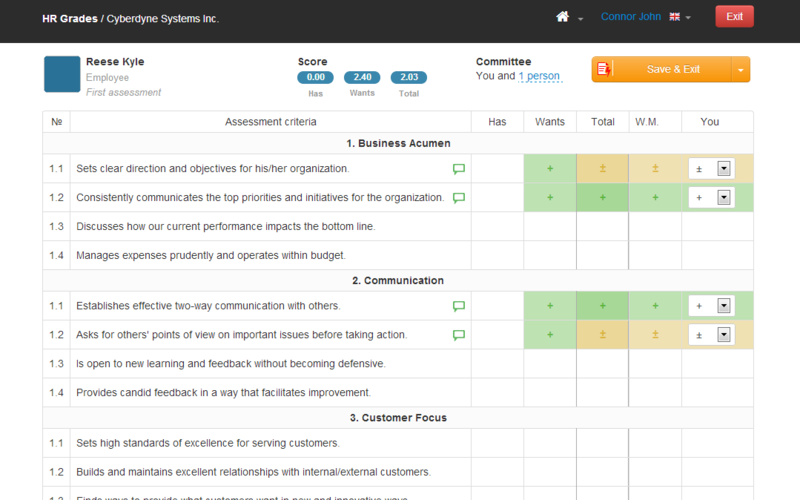 Choose the most appropriate scale for your competencies set. Use as many items as needed. Set custom representation and description. Switch between integer and fractional scoring. 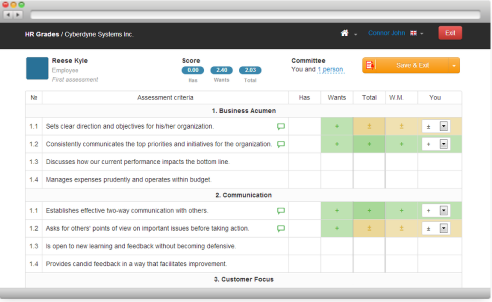 Combine competencies, scale and assessment strategy into an assessment program and then simply re-use it. Use different combinations for various groups. 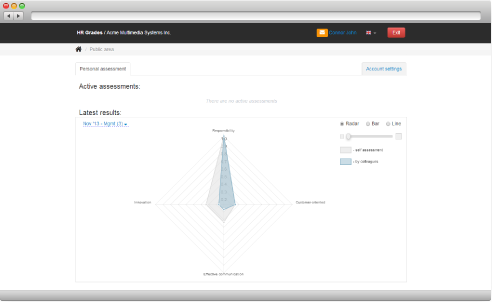 Choose the assessment approach which suits your company best: self-initiated, transparent, anonymous and so on. Use automatic or manual milestones change. Provide your feedback and recommendations. 60 days free trial for any subscription plan.